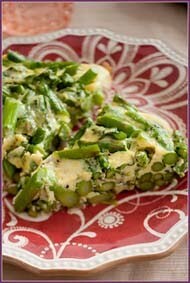 Mark Bittman turns the frittata by letting the vegetables outnumber the eggs. He recommends two or three eggs and three or four cups of whatever vegetable your heart desires. MY decision to follow a less animal-product-centric diet a couple of years ago has led me to experiment with a lot of recipes. But this particular “invention” (I’m sure it’s traditional somewhere) has stuck with me, largely because it is different, intriguing and good. Time to share.